Miss Berry writes to Mrs. Carroll to say that she is looking for someone to do publicity work who knows the newspaper business. She says that she needs to interview the person before hiring them, and asks Mrs. Carroll what she charges for her services and asks if she can come visit Mount Berry to be interviewed if Miss Berry pays for half of the travel expenses. 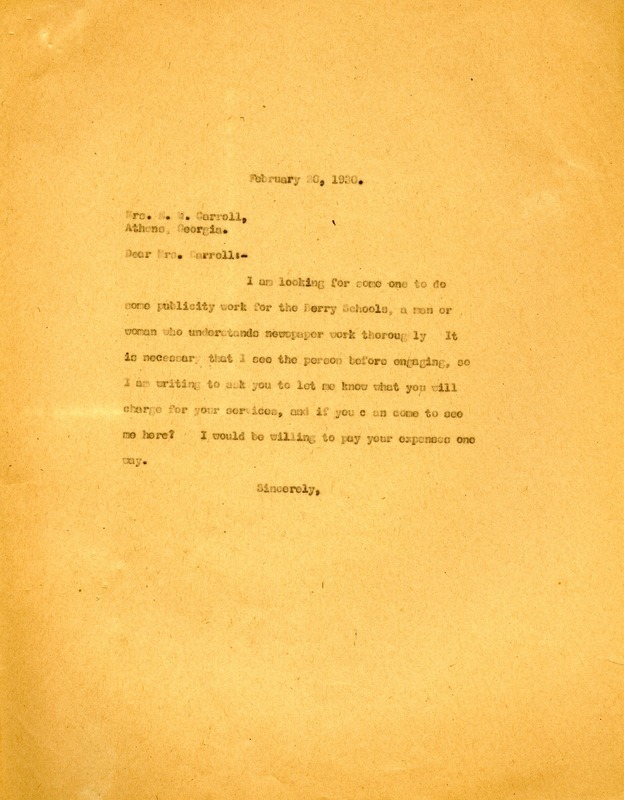 Martha Berry, “Letter to Mrs. E. W. Carroll from Martha Berry.” Martha Berry Digital Archive. Eds. Schlitz, Stephanie A., Chelsea Risley, et al. Mount Berry: Berry College, 2013. accessed April 24, 2019, https://mbda.berry.edu/items/show/12049.